Louis Poulsen pendant: This is one of the most salient Danish design classics when it comes to lighting. With a Louis Poulsen pendant you will set the tone to a sophisticated Scandi style interior. Acapulco chair: Nothing bores me more than one style executed to the very finishing detail. Be brave, be individual, make your character shine through. 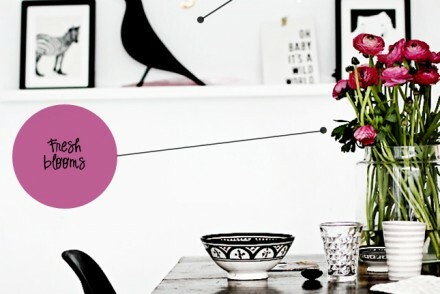 Here, the iconic 1950s Acapulco chair adds a Mexican vibe to this Scandi home. Sleek Scandi furniture: For a refined interior style, opt for sleek, elegant Scandinavian furniture design. Depending on your budget, you either go for one of the big names such as Arne Jacobsen, Finn Juhl, Hans J. Wegner or for the more affordable options at shops such as BoConcept. Do you like Scandinavian interior design? Anything that caught your eye here? I’ve always loved Scandi design, but I fell in love with it even more when I visited Sweden this past year. That pendant lamp is great! Me too! Visiting Sweden really added to the idea that the Scandi esthetic really exists. I feel very related to it. The artwork is very fun & I really like the graphic blanket too! Το Σκανδιναβικο design κατεχει πρωτιες. και φυσικα η ακτινωτή πολυθρονα που σπαει τις σοβαρες γραμμες των υπολοιπων επιπλων! Love that chair, so fun! Have you ever sat in an Acapulco chair. I just love the look of it so much, but I wonder how comfortable it really is, lol! Just in a store and it was surprisingly comfy! That couch is my dream couch. Structured but it looks comfortable and inviting. Love the painting with the bright colors! Well, well, well… The cushion and blanket on the sofa immediately caught my eyes, because I’ve been coveting them already for some time for my own reading corner in the bedroom 🙂 Both are from Ferm Living – so beautiful. And the PH lamp, many of my Danish friends have one at home, it looks as wonderful in a kitchen, than over a dining table, than in a living room: it’s timeless!